I am sure that Star Wars characters have their own preferences when it comes to what they drink. Who knows, they might even have the same tastes as you do? One thing you can’t deny, though, is just how cool this AT-AT liquor cabinet is. I have said it time and time again that I am not the biggest Star Wars fan out there, but I just couldn’t pass up on showcasing this. If anything, the AT-AT liquor cabinet’s eye as seen in the photo above just seems to be looking straight at me. Seriously, though, I bet that any Star Wars fan would give an arm and a leg – and more, perhaps – to have one of these at home. Forget your usual liquor cabinet when you can have something that can actually start up some of the best party conversations you’ll ever have! The AT-AT liquor cabinet may not be as classy as some of the furniture you’ll see in the pricey furniture stores, but for a conversation piece, you’ll be hard-pressed to find its equal. 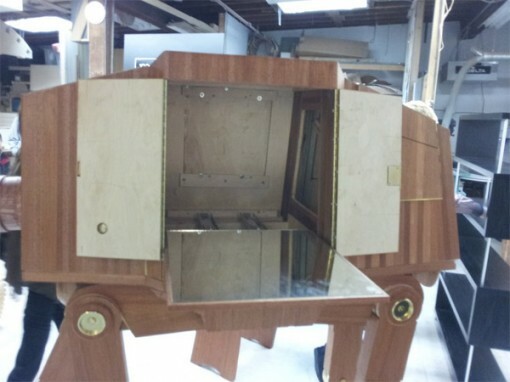 I have to be honest and say that it could look more polished, but hey, how many can say that have built a wooden AT-AT liquor cabinet? If the AT-AT Walker is not your thing, this can easily be a source of inspiration. Who says you can’t build your own liquor cabinet modeled after your favorite sci-fi character/vehicle/gadget?